We are looking to support learning innovations which have the potential to expand to other students, classrooms and schools in the school division and which focus on enhanced student engagement by empowering young people to explore their passions and create change in their classrooms, their schools and their community. Learning Grant requests will be accepted to a maximum of $5,000. 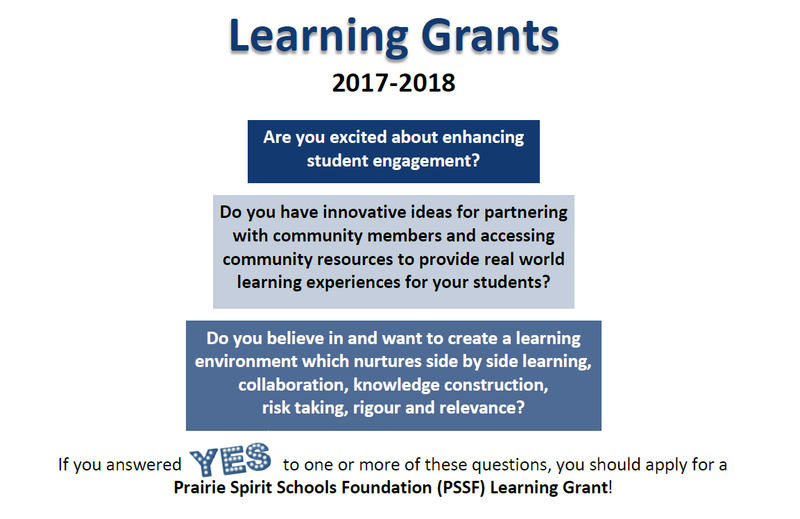 PSSF Learning Grant requests are open for all students registered at a school in the Prairie Spirit School Division. This includes individual students, student groups, classrooms and entire school communities. All requests are to be made through the school on the Prairie Spirit Schools Foundation 2017-2018 Learning Grant Request Form and must include at least one Teacher Leader and be supported by the In School Administrator. Completed Prairie Spirit Schools Foundation 2018-19 Learning Innovation Request Forms are to be submitted to psfoundation@spiritsd.ca by September 14, 2018. • Students are supported to seek new perspectives, create new knowledge and are actively engaged in their own learning. • Learning is relevant, rigorous and involves risk taking. This includes a connection to their lives now and in the future and involves critical thinking, inquiry and real world problem solving. • Learning environments support students to collaborate within and outside the classroom: learning side by side, strengthening community partnerships and leveraging community resources. 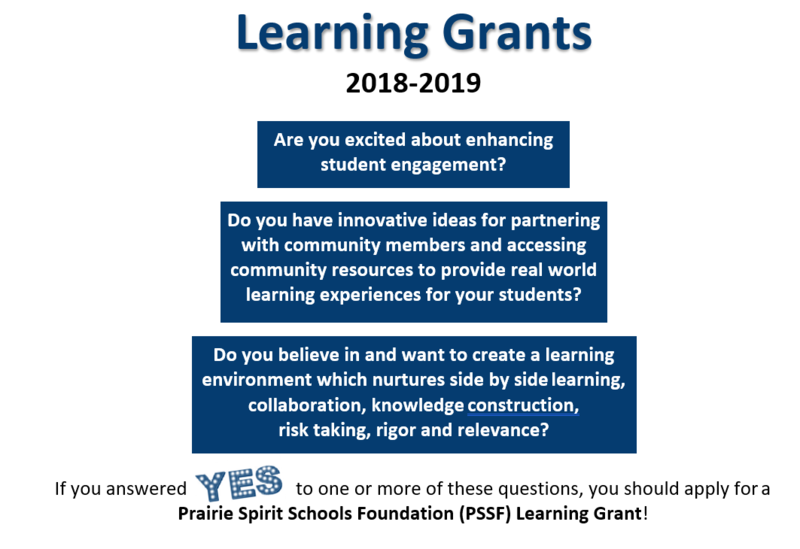 Grant recipients and amounts will be determined by the Prairie Spirit Schools Foundation Learning Grants Selection Committee by October 2, 2018. All applicants will be notified of the status of their request after that date. Applicants may be contacted prior to a decision being made to seek clarity regarding their request.